Bamboo seeds are scarcely available and also they have a very short viability of 2-3 months as they flower after a long interval and generally flowering is infrequent. Generally they are stored under controlled condition of 4 degree Celsius in desiccators under anhydrous calcium chloride to maintain viability for longer period of time. During storage upto 18 months, deterioration, increases with ageing. Biological membranes with a normal composition and organisation regulate the transport of material into and out of the cell. Damage to the organisation of cell membrane during seed ageing may constitute an important factor in explaining seed deterioration. The damage caused to membrane through deterioration that provides lower selectivity and hence increase in the leakage of solutes to the environment is one of the main cause of the decline in the physiological quality of seeds i.e germination studies and hormonal studies. Effect of hormone were studied i.e IAA, Gibberellins and Abscissic Acid after every 6 months upto 18 months period. One of the major changes during seed storage is membrane deterioration, which leads to the loss of seed viability. The aim of the study is to correlate membrane integrity deterioration with seed viability or physiology during storage upto 18 months in species of seeds of Dendrocalamus hamiltonii. 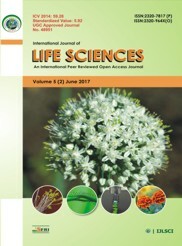 Geetika Singh and Richa (2016) Viability loss of Dendrocalamus hamiltonii seeds with storage associated with membrane phase behaviour and hormonal analysis, International J. of Life Sciences, 4 (4): 547-553. The author is thankful to ICMR, Govt of India for providing the necessary grant for carrying out research. Ching TM (1982) Adenosine Triphosphate and seed vigour. In: The Physiology and Biochemistry of Seed development, Dormancy and Germination (ed. A.A. Khan), pp. 487-506. Elsevier Biomedical Press Amsterdam. Cheah KSE and Osborne DJ (1978) DNA lesions occur with loss of viability in embryos of ageing rye seed. Nature(London) 272: 593-599. Copeland LO and Mc Donald MB (2001) Principles of seed science and technology. Lower Academic Publishers, Dordrecht. Bewley JD and Black M (1982) Physiology and Biochemistry of Seeds in Relation to Germination. Vol.2. Springer-Verlag. Berlin Heidelberg, New York. Richa ML, Sharma and Vikas Kumar (2010) Viability and enzyme activity of ageing seeds of bamboo ( Dendrocalamus strictus (Roxb.) Nees) in relation to exogenous plant growth regulators. Current Science, 99(11):1590-1593. Richa ML, Sharma and Kaur P (2000) Effect of exogenous applications of some plant growth regulators on enzyme activity with ageing of bamboo seeds. JPAS,2(1):35-42. Richa ML, Sharma and Neeru Bala (2006) Studies on endogenous levels of plant growth hormones in relation to seed viability in some bamboo seeds. Indian J. Pl. Physiol., 11(4):358-363. Wilson DO and Mc Donald MB (1986) The lipid peroxidation model of seed ageing. Seed Sci Technol.14:269-300. Pandey DK (1992) Liquid preservatives to improve longevity of tomato (Lycopersicum esculentum L.) seeds. Scientia Horticulturae. 62:57-62. Chabot JF and Leopald AC (1985) Ultrastructural aspects of chilling injury in soybean seed radical. American Journal of Botany,72:1120-1126. Hawkins CL and Davies MJ (2001) Generation and propagation of radical reactions on proteins. Biochimica et Biophysica Acta- Protein Structure and Molecular Enzymology. 1504:196-219. Kobayashi A (1989) Sotolon: identification, formation and effect on flavour. In Flavor Chemistry: Trends and Developments; Teranishi, R., Ed; American Chemical Society: Washington DC, pp 49-59. Abdul Baki AA and Anderson JD (1972) In: Seed Biology ( ed. T.T. Kozlowski) Academic Press, New York. Steponuks PL and Lanphear FO (1967) Refinement of the triphenyl tetrazolium chloride method of determining cold injury. Plant Physiol.42:1423-1426. Nagar PK (1996) Changes in endogenous abscissic acid and phenols during winter dormancy in tea (Camilla sinensis. (L.) O. Kuntze) Acte Physiological Plantarum, 18:33-38. Duke SO and Kenyon WH (1993) Peroxidizing activity determined by cellular leakage. In: Target Assays for Modern Herbicides and Related Phytotoxic Compounds. G. Eds., pp.61-66. Zeng YJ, Ewald A and Wang YR (2004) Methods of topographical tetrazolium testing for seed viability of Nitraria tangutorum Bobr. And N. Sibirica Pall. Seed Science and Technology.37:691-698. Moise JA, Han S, Gudynaite- Savitch L, Johnson DA and Miki BLA (2005) Seed coats: structure, development, composition, and biotechnology. In vitro Cell Dev Biol Plant41:620-644. Golovina EA, Tikhonov AN and Hoekstra (1997) An electron paramagnetic resonance spin-probe study of membrane permeability changes with seed aging. Plant Physiology 114:383-389. Gibson SI (2004) Sugar and phytochrome response pathways: navigating a signalling network. J. Exp. Bot55:253-264.